would anyone be able to help me install mine? i thought it would be as simple as swapping out the barrel, but when i got it all thouse wires and bits tell me otherwise. Thats really interesting, I just google'd what an LED hop up is. Interesting concept. 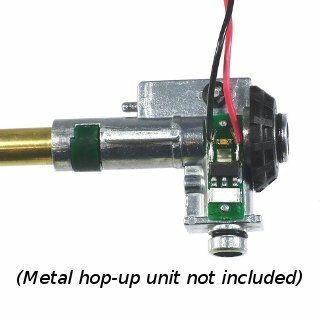 Do you have a compatible metal hop up already in your gun to accept the LED unit? I'm not real confident with a full tear down on the internals of the hop up (I've never tried taking a hop up apart yet). If its a contained unit and you just need help wiring it to the gun I can definitely do that for you. I would be willing to give you a hand too, I don't have alot of experiance, but after looking up what a LED hop-up is it looks like something that I could help you with. Let me know Shifty. thanks guys, the whole unit is a one piece metal hop-up, there's a slit where the LED board hooks onto it. it also needs to be wired into the motor. So, it needs to be wired into the motor and the battery right? I read online that it begins to draw current the moment you plug in the battery which made me think it was just an always on thing, but either way it shouldn't be much of an issue to wire it in where ever it needs to go. Yeah it actually runs directly from the battery. For wiring you split from, or solder to the main wiring harness. I could do that for you in just a couple minutes. HOLY CRAP! That was such a cool video. It makes me want to find some cover! NVG's have now moved from my list of "Maybe someday" to "maybe someday sooner". Tango... I may have an extra NV available (if I can find it, my garage is a disaster right now). Shifty... Tracers are a superb thing for night games, makes for better accuracy for the shooter, and its intimidating on the receiving end, but damn those BIO Tracers are expensive. @Twitch wrote: Tango... I may have an extra NV available (if I can find it, my garage is a disaster right now).